Certain auction houses have always held a sort of elite status in the auctioneering world. And while our huge range of salvage vehicles here at LAS are available for almost anyone to buy – sales of some of the most famous cars throughout history have often been a bit more… exclusive. This week, we look back at some of the most famous auction cars of all time. 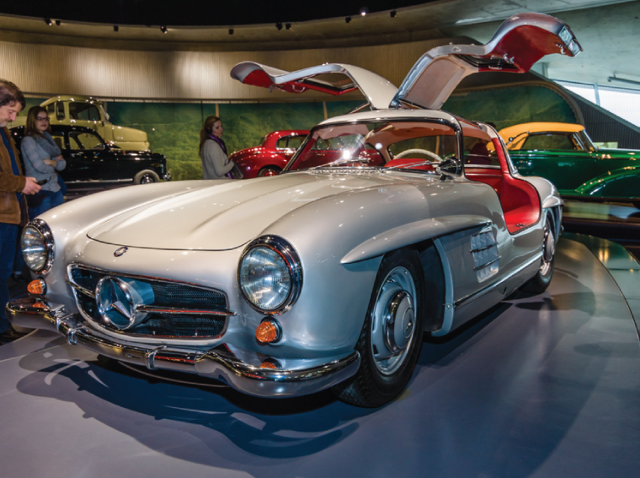 It’s unquestionably one of the most recognisable cars of all time, and you don’t have to be a lifelong petrolhead to appreciate the beauty of the Mercedes-Benz Gullwing Coupe. One man certainly did: Clark Gable bought his Gullwing Coupe brand new back in the 1950s, at a price of $7295. (That’s about £51,200 today). As well as being one of the most famous actors of the 20th century, Gable was also a keen hobbyist mechanic, so he made some brilliant modifications of his own. Amongst them were racing Rudge knock-off wheels, and a wood-and-chrome Nardi steering wheel. As you can imagine, all this prestige caused the car’s value to skyrocket over the decades that followed, and it was ultimately sold at Barrett Jackson’s Scottsdale Arizona auction in 2013 for $2.35 million (about £1.8 million). Of course, you won’t find an auction car with quite that level of exclusive prestige in our online car auctions here at LAS, but we still have an expansive range of options for you to choose from in our weekly online salvage auction. The Aston Martin is instantly recognisable as a Bond car, famously sharing the spotlight with Sean Connery for Thunderball and Goldfinger, two of the most classic Bond films. Built by Aston Martin, it was fitted out with an impressive array of functional gadgetry. It was loaned to production crew for the duration of shooting both films, and eventually reclaimed by the manufacturer. The DB5 was then proudly displayed at Aston’s headquarters until American radio personality Jerry Lee persuaded the company to sell it to him in 1969 for just $12,000. 41 years later in 2010, it was sold at RM Auctions’ summer sale in London for $4.6 million (£3.5 million)! To the Batmobile! Legendary automotive engineer George Barris acquired this 1955 Lincoln Futura concept car from Ford for a paltry sum of just $1. Shortly afterwards, he began transforming it into what would become the star vehicle of the original 1966 Batman television series. It quickly became established as an icon of American television, and one of the most recognisable unique cars in history. Decades later, at the age of 87, George Barris sold it at Barrett Jackson’s Scottsdale auction for a cool $4.62 million. Again, that’s around £3.5 million. Holy moolah, Batman! If you’ve ever seen a car ‘catching some air’ in the classic American serial Dukes of Hazzard, chances are that it’s the 1969 Dodge Charger. The ‘General Lee’ was the name given to one particular model that was frequently fired through the air over the course of the show’s production. One heavily modified version was altered by none other than John Schneider, Mr Bo Duke himself. It was auctioned in 2008, and sold for a reasonable price of $495,000 in 2008. Another Bond car, this one made its name in the film The Spy Who Loved Me. It’s most famous for its effortless transformation from striking roadster to graceful submarine. This one of a kind car was once described as Wet Nellie, and was bought in 2013 for £616,000 by tech magnate Elon Musk at a car auction in London. Here at LAS, we can’t vouch for what would happen if you try to drive any of our auction cars underwater! How do I register to Buy Category S and N repairable salvage vehicles with LAS? To register, simply fill out the registration form on our Registration page.